POP: Had chicken last night. POP: A week ago, Friday. POP: Heh! She'll only burn it. POP: Joan of Arc had less char than the last duck you cooked. AB: Alright, alright, kids. Come on. It doesn't have to be this way. AB: Nah, of course not. Look. What do ducks do? AB: Fly. Very good. That's why ducks have very high percentage of "slow-twitch" dark musculature which is not to say that they taste like dark meat. Okay, what else do they do? AB: Float. Ah. What else floats? AB: Small rocks. This isn't going exactly where I thought. Come on. Something else that floats. 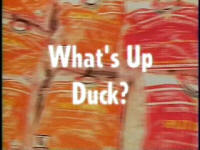 C2: Duck's made of fat? POP: That's why they burn. MOM: And make a mess of the oven. C1: And take 6 hours to roast. AB: Okay. Yes. Ducks do contain some fat. But that doesn't mean that we have to eat it. In fact, if we just apply some good, thoughtful cooking methodology we can make this into a flavorful, crispy-on-the-outside, juicy-on-the-inside meal. We don't have to make a mess. We don't have to make 6 hours go by. We don't have to make the smoke alarm go off. In the end, we'll just make some good eats. POP: Not going to burn it, are you? MOM: See what I've got to live with? You'd think that the culture that spawned Daffy, Donald, Darkwing, Duckman, Howard the Duck, rubber ducks, Mighty Ducks, lucky ducks, lame ducks, sitting ducks would put duck on the dinner table every now and then. And yet America's per capita consumption of this delicious water fowl is a measly 5 ounces a year. That means that your average American probably wouldn't even recognize a duck unless it had a silly voice and development deal at Disney. Now when it comes to real flesh and feather ducks there are dozens of varieties to choose from but odds are good you won't actually ever taste a black duck or a mallard or an American Canvass Back unless you've got a couple of Retrievers, a 12-gauge and a closet full of "Elmer Fudd-wear." Nope. Domestic cooks have to stick with domesticated choices. But to tell you the truth, that's okay. There are, of course, muscovy ducks which are a very lean, very gamy and usually only available in specialty stores or through mail order. Then there are moulards which are generally grown strictly for their livers or the foie gras. 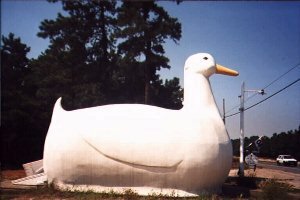 Now, the American market and, of course, the Long Island Skyline are dominated by the White Pekin or Long Island duck which, although not quite that big, are ... big. So big, in fact, that an American businessman touring China in 1873 mistook them for a rare breed of miniature goose. He bought 25 of them and shipped them home to New England. Now only 9 survived the trip but when they reached their final destination—a farm here on Long Island—they liked what they saw. They ate greedily, bred lustily and grew very fast creating in just a few years an industry which today makes sure that there are ducks on the tables of fine restaurants as well as the bins of grocery stores all across the America. Now these particular ducks belong to Doug Corwin whose family has been breeding White Pekins on Long Island for as long as there have been White Pekins on Long Island. So, he oughta know a little something. AB: That is a pretty duck. DOUG CORWIN: Beautiful, female—egg-laying female. AB: So this duck is strictly here to make more ducks. DC: Strictly here to keep us going. AB: Keep us going. Well she's got a gorgeous face on her. AB: So what are some pointers for consumers who are maybe going into the grocery store to duck hunt for the first time. DC: Well, they're looking for meat. They're looking to feed everybody. The meat on the duck is primarily on the breast. The long, flat, wide breast unlike a turkey which sticks up straight. AB: It's all the way over here. DC: It stretches out flat. It's a few inches deep. It's several ... It's 6 or so inches wide. And it's long. Look for that breast. Be careful that you're not finding a packer that may be taking these legs and shoving it up and making a nice little round Butterball. You really want to look for the breast of a bird. DC: Because long, wide and flat ... because this is where the meat is. AB: So how do you like yours? DC: Oh, I love to take a breast either skin-on, skin-off, throw it on the barbecue for 3 or 4 minutes each side, eat it like a steak, a little bit of salt, onion powder, medium rare. Just a beautiful tasting piece of meat. AB: Sweet. Thanks a lot, Doug. Unfortunately, Americans don't eat a lot of duck ... yet. This is why most processors prefer to bring their quackers to market in the ultimate state of suspended animation. And you know what? That's okay by me because a bird that's frozen at the plant will most likely walk into my door in close to the same condition. ... thermodynamics. That branch of the sciences concerned with the transfer of the energy we call heat from one body to another whether it's ice cubes in your tea, a ham in the oven, a lima bean simmering on the cook top or a duck thawing the refrigerator. Thermodynamics make the kitchen world turn sometimes in unexpected directions. Case in point: setting aside sanitation concerns, what do you think would be the best place—fastest place—to thaw this block of bird, that is convert the liquid held in its tissue from solid to liquid state? Refrigerator? The counter? Barely running cold water? Or 200 degree oven? [camera pans around] Go ahead. Pick. Pick. [camera pans to the oven] Ah see, you're getting colder ... well, I mean warmer technically but colder, you get my drift. [camera pans to the sink.] Cold running water. Messes with your mind, doesn't it? You see, the thing is is that there are more issues with thermodynamics than just temperature, temperature being the thing that we measure with these [thermometers]. What are those other issues? Density, conductivity and convection. AB: Now keep your pants on, Pops. We're getting to it. Hey, Paul. How's that project coming? PAUL: I'm really proud of these ice ducks. I'm going to put them in my freezer and enter them in an ice sculpturing contest. AB: That's great. They look really great. But hey, let's do some experiments on them first, what do you say? Okay? Why don't you put Daffy in the refrigerator. Daffy into the refrigerator. Okay, and Donald—we'll call that one Donald, okay, Donald—put Donald into the 200 degree oven. AB: Let's take Howard there and put him in 60 degree water. Ah, now the plot thickens. You see, water is extremely dense so more of its molecules are going to surround Howard than, say, the air that's going to surround Donald, okay? And because water can absorb huge amounts of energy without changing temperature, well, let's just put it this way, that's called conductivity and that is why we put water, not air, in our radiators and that's why Howard is going to melt before, you got it, Donald. AB: Now, um, let's do one more little experiment, here. Why don't you take Darkwing and put him under cold running water and take Duckman and put him in a pot of boiling water. or liquid resulting from heat and/or gravity. AB: Ah, Paul. Do we have a winner? AB: ... what would you say, Paul, a blue bar of soap? Yeah. Uh, now where's the under-cold-running-water duck? AB: Oh, well, there you have it. In the rock-paper-scissors world of thermodynamics convection, density and conduction win out even over high temperature. AB: Now, what have we learned, Paul? Okay, I'll tell you what we've learned. When it comes to thawing, you want two things: you want to thaw the food but you also want to keep it out of the bacterial danger zone which means no hot methods. So, either thaw in the refrigerator—which, of course, will take a lot of time to get the job done—or thaw submerged in barely running, cold water. It's the fastest way to thaw. AB: Now, Paul, what were you saying about a contest? I told you thermodynamics were fun. Now, as anyone who has seen our Thanksgiving show can already tell you nothing enhances the flavor or texture of poultry quite like a brine. Now there are only really two prerequisite ingredients for a brine to be a brine: one is water the other, salt, in this case half a cup of kosher salt. Now when it comes to the water portion of the program that's where we can have a little bit of fun. In this case we're going to go with a pint of pineapple-orange juice. Now for the flavorings, I always turn to black pepper, whole black pepper corns and at least 15 of them. And to up the ante a little bit in the spice category we're going to add some thyme and some garlic. One very small bunch of whole thyme—leave it whole—and 4 cloves of garlic. Oh, excuse me. [crushes garlic] Ah. There, that's better. Crushed. Now lid it up and make sure that the lid is on all the way around. Then shake to dissolve the salt. There. Now turn your attention duck-wards. Calling a rainy day "a good day for ducks"
is ironic considering that ducks hate rain. POP: About time you got to the duck. You could brine this whole but it's going to go a whole lot faster if you draw and quarter first and on top of that it's a lot of fun. So, approach your duck on your board and make sure that it's your poultry cutting board, okay? Ducks are not famous for carrying salmonella but it doesn't hurt to play it safe. Okay, first thing you do, see this thermometer? Throw it away. There. Also, in the caboose you'll find, usually, a package of sauce. If I pulled a bag of sauce out ... never mind. Okay. Throw that away. Now, as far as the neck and the gizzard and the heart and the liver believe it or not these are good eats but they're another show. So, off they go. Next off comes the wings. They only get in the way. Just slice through, bend it back. Save these. They make great buffalo wings on down the line. Take your kitchen shears. Find the spine. It's right there at the base of the neck and just cut right up the line of the backbone with your kitchen shears. It's like Braveheart, Part II. There. I like, since I'm right-handed, I turn around and go back up the other way. There's a big wad of fat right there on the end of a duck. It keeps his rear end out of the water when he swims. And cut it right up the side again. Now believe it or not, as ugly as it is that back is loaded full of flavor and collagens so it makes great stock. So, I freeze that with the wings. There's nothing to waste on a duck. Okay. So, we're going to turn it over again and cut right down the middle of the breast. There. You've got two half-ducks. Great. Now you've got to grab your knife again. We're going to get the dark quarters off, so ... kind of make a crescent shape, a crescent cut like the moon right across there. There. As far as the breasts go, there's a lot of what's called subcutaneous fat just under the skin. We want to give it some exit points so that as it cooks it'll come off; it won't have to seep around the edges. So take your knife and just lay it flat against the skin then barely push down as you drag across and mark the side. The goal here is to cut through the skin but not all the way through the fat to the meat. That would be a bad thing. There. Three cuts one way and three cuts the other. There. That's called scoring. Now this all goes in a bag. Now, deposit your drawn-and-quartered bird into a zip top bag inserted inside a Lexan container available at your friendly, neighborhood restaurant supply shop or a pot or pan will do and just pour the brine right on top. Now when it comes to sealing the bag you want to be careful to get as much air out as possible. For one thing, air does not add any flavor to duck whatsoever and the less that's in the bag, the more brine will actually be in contact with the duck. There. Now, give the brine two to two and a half hours in the refrigerator to do its voodoo. Now, while we're tripping the thermal dynamic, we should stop—as Sinatra used to say—and take a steam. In fact, a 45 minute steam would be the perfect phase one of a two part or combination cooking method that will conclude with a blistering pan sear and one heck of a dinner. So, go ahead and bring an inch and half to two inches of water to boil in your largest pot. Then reach for your favorite steaming device. Now I know some of you own specialty steamers but I don't know why when you've already got this [metal colander] sitting around in your kitchen, right? So, in it goes. You can use any steamer you like except for a bamboo steamer. Think about it. Raw meat, porous product. It's not a good idea. Okay, next, the duck. Now the trick here, if there is a trick and I'm not saying there is, is to get this to cook as evenly as possible. So, what you want to do is line the sides of the colander. You don't want to pile this up into a giant, kind of, duck-loaf or you will end up with some pieces that are very, very done and some pieces that are completely and utterly raw. So just stack them around the outsides. If it hangs off a little bit, that is no big deal. And if you get a little bit of the thyme or other herbs in there, that is not a problem either. Now, on with the lid. Add a weight to the top of your lid, turn the heat down to medium low—that'll keep this from lifting off—and set your timer for 45 minutes. Now, why bother with steam in the first place? It's a good question. But unfortunately, my staff Thermodynamicist took the day off to play golf. But, hey, my plumber Drips is here. AB: Hey, Drips, you know from steam, right? AB: Hey, Drips. Keep it about the duck. DRIPS: Oh, okay, okay. Well, since it's less dense, steam will cook your duck more gently than water but far more efficiently than air. And it won't wash away your seasonings. AB: ... pressure cooker, but hey, that's another show. Thanks a lot, Drips. DRIPS: [comes out from under the sink] Good. Now can we get on with the rest of the show? Technically, anything powered by a nuclear reactor is powered by steam. Having folded space and time, not only has our duck finished steaming but I've had time to boil out the rest of the water over high heat. Why? Well, if only you had smell-a-vision you'd know: duck fat, liquid love. One of the most delicious substances on earth and very low in saturated fat. Now I like to cube red potatoes, simmer them in some salted water, drain and sauté in duck fat over high heat. Speaking of high heat, did I mention that you should have your biggest cast iron skillet in a 475 degree oven getting NASA hot? Well, you should because the final act is upon us. Now, you can see that the skin is taut but there's still a little bit of fat under there and that is going to lead us to a crisp, crunchy skin. And any duck lover will tell you that's almost as good as the meat itself. So, make sure that your skillet is really hot. [throws some water on it and it evaporates] That would be really hot. And lay in just the leg quarters skin side down. Now since they contain a good deal more fat than the breast quarters we're going to give them a 10 minute head start. Time for the breasts. Just roll the leg quarters up to the kind of the side of the pan like that, that's gorgeous, and carefully, please, add the breasts. Just get them in the pan, kind of mash them down. You want to get as much contact with the skin as possible. Now this goes in and we give it another seven minutes. much fish that they actually taste like fish. Aah. Behold the magic of duck: crispy skin, mahogany and dark over luscious, melt-in-your-mouth meat. Now, take this all off and give it a rest on a plate. I like to set a bowl in the middle so that it doesn't just sit in its own fat. Nice to let it drain a little bit. And you want to cover this not so much to give it a rest—it is poultry so it doesn't really need it—but to get it from getting cold. Just don't put it on too tight or the steam will be trapped and what is now crispy will turn gooey and that's bad. Now, here we are with this nice hot pan full of the aforementioned liquid love and it would be a real shame to waste this. So I'm going to toss in a couple of handfuls of shredded chard. You can use any hardy green. And believe me there is enough heat in this pan to, I don't know, a farm's worth of this stuff. Now once you've got that in add about, I don't know, maybe a minced shallot or two would be nice. There we go. Don't put the shallot in first or you'll be in big, big, big trouble. Now, just toss this around. You just barely want it to wilt. Do this with your spring loaded tongs. You'll notice I'm keeping my glove on. There's a reason for that. And just when it starts to wilt, hit it with a little sherry or balsamic vinegar. Just for flavor. Toss again. Remember, there's lots of salt in the duck so we haven't added any yet. [takes a taste] And we're not going to add any. Alright. Time to plate. POP: I thought you were going to talk it to death. We hope that we have piqued your interest in and appetite for the original Chinese take-out, Long Island or White Pekin duck. Just remember: thaw under cold running water, draw-and-quarter, brine, steam, sear and don't waste the fat. Believe me, after you try this you'll never look at Daffy or any of his chubby little nephews without thinking of good eats. POP: Junior, at least you didn't burn it like your mother usually does. AB: Dad, I told you not to call me Junior. AB: [talking to a duck] You know there's a platypus named after you. Proof Reading help from Jon Loonin.